Winter Bird sightings and feeder tips. We have hawks here but not sure what kind sometimes they are sitting on fence post along the roads here in Rural Becker county.They are impressive in their size! Not a feeder tip - but I am seeing lots of Rough-Legged Hawks this winter, on telephone poles, as I drive to the next town for work 2X a week. a feeder tip from mary ann Butler,Hope Maine.I hang feeders from cables and pulley devices.When they need filling,just release the cable and lower the feeders.Then I'll raise them to a height out of reach of most ground predators. OH I love cardinals sure wish we had them here but no such luck!! I bought a bunch of the suet blocks on sale and have three out, the birds are going crazy for them! !Lots of different woodpeckers its really neat to watch! You are sooo lucky to have Cardinals I love them but we are too cold for them I think never see any here!! We've been keeping the feeders full. With the snow on the ground (and more to come tonight it seems). I've enjoyed being able to sit back and watch all these birds at the feeders. Yes, the raccoons were bad here this year too. My daughter in law has a fox living right out her back door practically. She sees him/her in the daytime as well. The birds are eating me out of house and home - I love it! Yes the little chickadees are soooooo cute!I saw a blue jay 2 days ago in the feeder I have to buy more feed today as we are expecting the storm of the Century as they are calling it to begin tonight sometime and they will need all the food they can get! !Thats really bad fox in the daytime there are sure a lot of predators around these days! My daughter had a fox come and take one of her chickens in broad daylight last month! It's cold and my feeders are getting lots of traffic. I'm filling everyday. A chickadee followed me to the mailbox yesterday to remind me to fill the feeder. I love those cheery little birds! I heard a strnge call last night before dark and saw the bird flying but it was too far away to make out what kind it was?It was pretty large.A couple nights ago my dd had something kill and half eat one of her ducks and I thought it might have been an owl.The next night sure enough around dark my gd went out to water them and there was a big owl that took off out of a large pine close by the pen.She will have to put up a wire top on the pen the rest of the ducks must have made it inside the house before it could get them.The owls are really bad here I have lost pets through the years and suspect them! They may take a few days sometimes it seems like mine do.Sometimes I dont notice them for a while either.The cover of the new B and B is just beautiful isnt it!I wish we had cardinals here!!! Here is a birdfeeder idea from B and B .I recieved one of these from my sister last year and the birds really LOVE it!She made it in a few min and it has provided me with lots of bird entertainment! Suet Log Feeder --- To make this gift ,all you need are a short log and a drill and about 5 min of time.drill large holes in the log on all sides it can come with a jar of peanut butter for filling the holes with or if you make it for yourself just fill holes with any peanut butter and put a screw hanger on the top for hanging in the trees or from a shepards hook.Great gift for the bird lovers on your list.You can cut a short log in half as well and just drill holes on the one side . I have used mine all winter and it works just great boy do I go thru the peanut butter! Yes anya they are big arent they so neat that you got to see them!There is a mother and her brood running round here this year and the little ones are now quite grown up and they are a noisy bunch!I have seen them a couple times once in my pasture and yard another time. I saw my first wild turkeys on Thanksgiving! My dad is always saying things like "12 turkeys walked through the backyard last night" and stuff. I am so excited that I finally got to see some. 2 females and were they BIG! Saw those tips in my B and B this month. I really liked the crock pot idea and the corn cob one. Still dealing with the squirrels. I'm going to try sprinkling cayenne pepper on my suet cakes and put them out there. I'll let you know if it works. FROM B AND B DEC./Jan.--dUAL PURPOSE CORNCOBS. An ear of dryed corn attached to a board or tree limb is an inexpensive way to feed birds like blue jays.After the birds have eaten all the kernals,spread peanut butter on the cob and roll it in birdseed for an extra winter treat! I heard our wild turkeys this morning but couldnt see them.New B an B says an old slow cooker set on low makes a good winter water source for the birds.A piece of lattice set on top makes a good place for them to sit and drink! I harvest a lot of my poppy and merigold seeds and some other flowers at times. another tip from B and B.Storing seeds-- To harvest seeds of flowers like cockscomb (celosia) put the dried seedheads in a brown paper bag to dry.The seeds fall off, then plant in spring. Ssve money in your backyard with these ideas from Birds and Blooms mag.Milk Jugs--some ideas for uses. 1.Cut them into strips to make plant markers. 2.Use them as collars to keep cutworms from destroying young plants. 3.Make a simple watering can.Just cut a small hole in one corner on bottom and set it next to a plant.The water slowly seeps out. 4.Cut a hole in the side and make it into a bird feeder. 5.Slide it over your bird feeder pole as a squirrel baffle. 6.Cut off the bottom and one side up to the handle for a scoop for birdseed or potting soil. Amy my neighbor saw a sissor tail today!She was really suprised because they are not here as a rule. Love bluebirds ours have been gone awhile now! !I dont see any robins anymore either.We are having some warm weather this week its so nice to have some this late! I went on a run yesterday and saw some bluebirds. It so felt like spring out. Still seeing the juncos at my feeders though. We got the cat - hoping he'll deal with them. I see my crows are still hanging around the pasture!I have a family of them, every summer they have young ones.I watch them a lot as they are fairly close to the house. oh misunderstanding, the kittys were after the squirrels not the birds . I dont think we have those I have not heard of any here? Melt beef suet in pan over low heat.Then add the peanut butter and cornmeal.Mix together . Spoon the mixture into paper lined cupcake or muffin tins and allow cakes to cool. When hardened , remove from the tins and store in the freezer until needed.You could also add raisins, sunflower seeds, rolled oats or chopped apples to your bird cake mix.Woodpeckers, chickadees and nuthatches are a few of the birds you could attract. That is why when you have an outdoor kitty they say if you care about birds, you should put collars with bells on them. I did when we had cats that went out. I was just going to say that the only birds that I have seen in quite awhile around where we live besides starlings are scissor tailed fly-catchers on highwires. I bet they will be careful about messing with that suet now!! They are eating the suet. Hubby's bringing home a kitty - it better stay away from my birds! Saw a junco this morning, btw. First I've seen of them this year. Did I ask you before what they were eating them out of if it was the suet holders or something else?Boy my memory is bad! I have never heard of peanut flour before?Here is another recipe from my yesterdays Birds and Blooms Extra magazine. Attract woodpeckers , chickadees and nuthatches. Melt lard and peanut butter.Stir in coconut,oats, and cornmeal.Add optional ingredients if desired.Pour mixture into a pan and chill in refrigerator over night.Cut into squares and wrap in plastic for easy storage. Thanks. I'll make this and give it a try. I have some peanut flour that I bought last year for something and don't like it. Wonder if the birds would like something made out of that? From Birds and Blooms Mag. Fall Feast for the Birds---Spread this mixture onto an empty sunflower head! Boil water and mix in just enough cornmeal to cook into a soft mixture.Remove from heat and add oats ,peanut butter and birdseed.Make sure the mixture doesnt get too thick. Press into sunflower heads and hang from a tree or feeder. going to post some info about feeding birds from birds and Blooms here this week!Its time to get our feathered friends some winter goodies. Welcome Amy I have been to Branson for a fall convention MANY years in a row but not last year!I LOVE Missouri!! We live in Southwest MO, Jasper County, Joplin. The Scissor Tailed Flycatcher is OK state Bird. This year on the highwires alont the edge of town there are scissor tailed flycatchers everywhere, it seems to me. In town you can see pigeons, we have a couple of cardinals, robins, blue jays in our yard and some geese live close by. The scissor tailed flycatchers are the birds that I have seen the most of this year! Sherrie have you taken any new pictures lately? It works Sherrie How cute..
Silver that is so neat to hve baby goats!Have fun they are sooooo cute! !I am soooo glad the stinking snow is gone but there are whispers of some in the forecast hope they are wrong! Sherrie the baby bird is soooo cute! I saw our loon in the dd pond last week when I released my mallard ducks there I think it was on wed.It left for another body of water when she released the 3 tame geese there on Sat.I am sure it was only there cause no lakes are open yet! 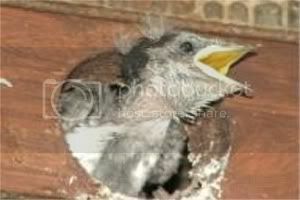 Here is a picture of a baby swallow in the bird house I put up when I blocked the hole in the eaves. They come back every year to nest. I bet the twin girlie goats are cute! The ice is totally gone from the bay today, and I saw my first loons of the season this morning. They are so distinguished. As I just looked out in the bay I saw one of the Osprey fly by, and can hear them constantly making their high pitched noises. They are very noisy birds! YIPPIE for no snow Oh you must be so happy They are still getting snow up North I am glad to be in the Southren part of the state . We have orioles on the humming bird feeder here too. I am so happy about that. It is going to be interesting to learn which birds will visit us. Sherrie that is a good idea plugging the hole and putting the birdhouse there!So our snow is FINALLY GONE!!! Now they say we will be 80 this coming week from winter straight to Summer it looks like.The bluebirds are back now and the herons and swans and soon the wrens should show up with the hummingbirds and orials,2 weeks maybe.My tulips and daffodils are growing real fast now! The neighbor and I have birdhouses, and they are 'NO VACANCY' during the swallow season! Plus, the swallows will take any 'hole' they can find to nest. I plugged a hole in my eaves and replaced it with a birdie house!